By resurrecting the denim-upholstered “Jeans” Beetle for what I think is the eighth time in overall Beetle history, Volkswagen has solved all of their current Dieselgate problems, and now everything is great forever. revives the rich heritage of the Beetle brand, offering fans a modern take on this classic model. ... as VW’s press release tells us. What they didn’t mention was that the new Denim edition Beetle so sparks a latent mass of goodwill that the EPA has decided to drop all charges and potential feels relating to Volkswagen recent cheating on their Diesel emissions. “Look how much this convertible top resembles a pair of old, beloved jeans,” shrieked EPA Administrator Gina McCarthy at a press conference I’m imagining. 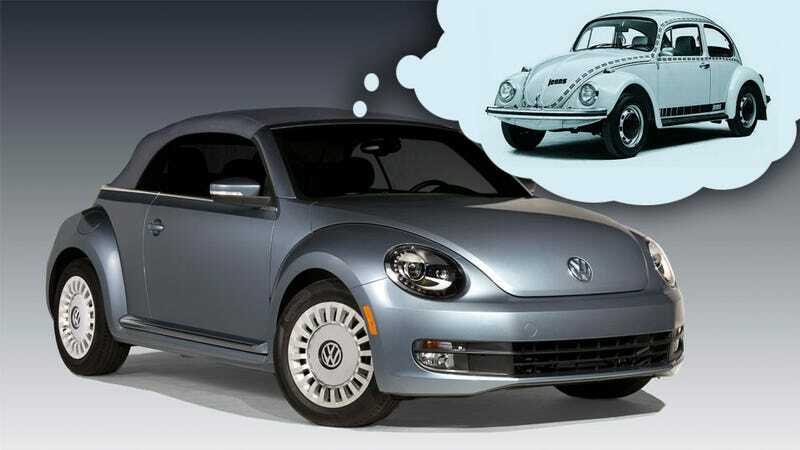 “Everything’s cool with us now, VW,” said McCarthy, rolling around delightedly on the back seat of a Stonewashed Blue (one of the two colors offered, along with ‘Pure White’) Denim Beetle convertible. McCarthy then paused to inspect the pocket on the back of the front seat. McCarthy demonstrated that her wallet did indeed fit inside the seat pocket to Stan Meiburg, EPA Acting Deputy Administrator. Though no Jalopnik reporters were at this press conference, which took place entirely within the small enclosed volume inside my cranium, we can answer the Acting Deputy’s question: no. The convertible top has been finished in Dark Blue with a brand new textured fabric that resembles denim. Interior design features include a unique light-blue-and-silver dashpad and jeans-inspired seat pockets with small Beetle tabs in red. The light blue denim-color cloth seating surfaces also feature white piping and dark blue leatherette accents. So, unlike the Jeans Beetle of 1974, the Jeans Beetle kit of mid 1974, the 1975 Jeans Beetle, the 1976 South African Jeans Beetle, or the 1982, 1995 or 2000 Mexican-market Jeans Beetles, the current Denim Beetle does not actually use real denim. To clarify, this press release also exists only within the neural network of my cerebrum.